Very basic things first ne! To make a Fushigi Yuugi web page, you must first have web space. Most ISPs will provide webspace but also there are many free sites out there like Tripod, Geocities Xoom, FortuneCity , and other sites ne! I have webspace, what now? So, you've picked up your free webspace, or talked to your ISP. And you sitting staring at the screen wondering what to do with it, ne? Well, first, decide what kind of webupeeji you want to have. You mean there are different kinds??? Oh yes! 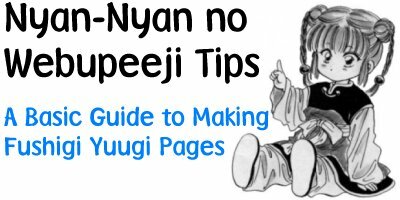 Nyan Nyan knows there are always many different types of webupeeji and there is always room for more ideas! There are webupeeji dedicated to general information. There are webupeeji dedicated to one character. There are webupeeji dedicated to one side. There are character shrines. There are fanclubs. There are anime image galleries. There are manga image galleries. There are sites devoted to fanart. There are sites devoted to fanfiction! Nyan-Nyan gets tired just listing the amount of different types of sites! And there are new types popping up everyday! Okay, I've decided I want to make a character shrine to Suboshi, what now? This is where HTML comes in. When you open a browser in Netscape, or Internet Explorer, and look at at webupeeji, it is HTML that makes that possible. HTML defines what others see on your webupeeji. HTML stands for Hyper Text Markup Language. There are many ways to learn it. You can take classes at colleges to learn it. You can ask friends who design webupeeji to teach HTML to you. You can learn it from books. You can even learn HTML on the internet! The best place to learn basic HTML on the internet, is at the NCSA webupeeji. The NCSA (National Center for Supercomputing Applications) has a comprehensive online guide, good for a beginner, just starting out. As you become more advanced, and need to move beyond the most basic commands, the NCSA website is still good, and there are more webupeeji out there to teach you! How Do They Do That With HTM? And of course, there are HTML editors! There are various other places you can get editors too! Okay, I think I have this 'html' thing down. But it's only text! Well, you want graphics then to make the webupeeji pretty, ne, ne! First you want to find a graphics program! Photoshop, Corel, and Paintshop Pro seem to be the mot popular ones. And they are very handy too! Photoshop and Corel Photopaint you have to buy. But Paintshop Pro is avaliable in a shareware version that you can find at the links Nyan-Nyan gave above for the html editors! Well, I've got the program, now what? See! Graphics can be fun, ne! So ... Now that I know how to use my graphics program, and I've got great idea for graphics, where do I get the basic pictures? Well, there are many image galleries that you can get images from. But always ask first, and credit the site you got the image from! Or if you have access to a scanner, you can always scan in manga shots of ... say Nyan-Nyan yourself, ne, ne! And there are webupeeji that provide free graphics, but once again always provide a credit and a link! If you didn't the Four Gods would smite you! What's so bad about linking directly to images and files? If Taiitsu-kun heard that, she'd be very angry! It steals bandwidth . Bandwidth is the amount of traffic (KB or MB per second) that a person's ISP is capable of handling at once, or that their ISP allows them to use at once. b) other providers, esp. some of the free ones, can become VERY slow if they have too much traffic, either due to the bandwidth or due to the machine running their web server not being able to handle all the connections it is receiving. When you link to someone else's images, these problems increase, but the sites actually ON the server suffer without even being looked at. In addition to stealing bandwidth, stealing the graphics themselves is BAD. Taiitsu-kun would punch Nyan-Nyan through the roof for it! Why? Here are some MORE links for you to look through, ne? The WDTV: Purloining and Pilfering page has a more in-depth discussion about bandwidth/image theft and what do do about it. So, I've become a HTML Wizard, I've got great graphics, and designed my site! Can I go on the web yet? Nyan Nyan says not yet! There are few things to do first. You need to check your site in many ways. First, there's the possibility of copyright infrigment. Laws about Multimedia Copyrights - otherwise known as the GAINAX syndrome. Well, be considerate, first off. If the webupeeji says clearly, "Don't link to me! ", then don't link. Simple. On the other hand, if you use information from that paticular webupeeji. DO CREDIT THE INFORMATION! Simple enough even for Miaka to understand, ne, ne? Simply put, anything original, once it's written down, it has been copyrighted. The ideas are not copyrighted (perhaps patented ), but the words and phrasing used is. So, if you encounter a paticular paragraph you like, or even a whole page, and you'd like to use that for your own webupeeji ... Well, unless you get the author's specific permission you are breaking the law. That's too much for even Nyan-Nyan to naosu! Nyan Nyan is going to define what is meant by copying! Copying can take many forms. Paraphrasing. Copying parts of a document. Or copying the entire thing. It doesn't even matter how the document is copied, whether electronically or written copies. This is all bad! The Four Gods would be forced to vaporize people who did this! It is far beyond Nyan Nyan's power to fix! What is a trademark? A trademark essentially is a brand name, or a logo/design for a company. Kleenex is a trademark. Nike is a trademark. How do you get a trademark? Like a copywrite, there is no real registration required. As soon as people start to associate the product with the logo, then a trademark has been established. Nyan Nyan thinks this infringement problem occurs more in commercial webupeeji use, than in personal. But it still deserves mentioning, ne, ne? Nyan Nyan knows this is very bad, and knows that you do to. Don't steal! The Four Gods like to smite people who steal. So does Taiitsukun! Most pages have an "Our Policy On This Page" listing, or say how the webmaster feels about what can be used from their page, and what can't. Nyan Nyan knows that all of you will follow the webmaster's wishes! If you don't agree with their wishes, then think of how you would feel if you put time and energy into creating something wonderful, and it was stolen! Nyan Nyan is disappointed by the fact that there even has to be a section on stealing. Nyan Nyan says don't do it! How to naosu-naosu the webupeeji! Now you want to naosu-naosu your pages? So you don't steal bandwith or images? Waii! Now, go to the WebGuard page to find out how to fix your peeji so it's better! Of course, it involves a lot of downloading and reuploading and link changing, but it's definitely easier than trying to fix Taiitsukun's face! Free-Help.com might also be able to help you! So, is that it? Am I finally done? Nyan-Nyan says NO! One more final thing to do! Don't forget to credit the owners of Fushigi Yuugi! Nyan-Nyan says that NOW you are ready! Wai!